Friends New year is again round the corner. We are all determined to celebrate this new year too with great fan and fervor. Like last year we would pass new resolutions for the coming year. No matter how early we break our new resolutions but this is for sure that we would make new one this year too. We are all too firm this year to not to break our new year resolutions. Rest all depends of God's will and our circumstances. Like we all do, some of my friends would resolve to start morning walk from this year and some would resolve to quit smoking. Many would repeat their last years unfulfilled resolutions, but have you ever thought what resolutions would you make this year regarding Tally. As we all know we pass new year resolution because these are the things which we really want to do but are hard to follow. They are actually good and are beneficial for us. Like wise Tally is also beneficial for us and we all know that our business, job, profitability all depends on that. So we should pass a resolutions this year regarding Tally. What is your new year Resolution for Tally? 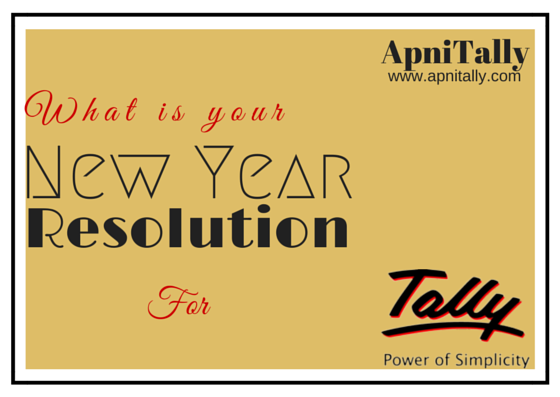 So My question is what resolutions would you pass this New Year related to Tally? Have you given a thought over it? If no then why not? Give a thought this year on Tally. When you would start thinking you would find that there are many possibilities which can be explored. What can be your New year Resolutions? Possibilities can vary from person to person. If you are a businessman then first resolutions you can pass on Tally is that I would go one level up in using Tally. In other words if you are using Tally just for debit and credit entries then you can resolve to use it a little bit further. Your Goal can be I would start my Invoicing in Tally. Another resolutions can be I would start using Inventory with Accounts from this year. Another resolution can be I would automate my cheque printing via Tally. No more Manual cheque writing form this New Year. If you are s student then you can resolve to spend more time of Tally. or in specific terms you can resolve to master additional module like payroll or excise this year. Another resolution can be I would become Tally certified this year. An employee can resolve to use additional features of Tally is his day today working. To be more specific you can resolve that this year I would prepare all my VAT or Excise returns on Tally. No more manual returns. Bloggers like me can resolve that they would try to post One tally post every week. If they are doing this then they can resolve to increase their frequency. You must be thinking what is my resolution. My resolutions for this year would be that I would write more and more interesting posts on Tally in year 2015. Almost every week an new post I would create. Let me know as Tally user what is your Tally resolutions? What would you resolve to do this year? Share your view It would help others to define their goals.